There are a few things that never seemed to sit right with TMNT and other Strangeness. One of those things was the idea of characters having independent sliding scales defining their hands, the degree of bipedal stance, and their human appearance. The signature characters, the Ninja Turtles clearly have full hands (because they have no trouble manipulating tools and weapons), full bipedal stance (because they clearly walk around with no problems), and full speech, but no human appearance (they look like turtles, and there's no way someone could mistake them for human). I'm not a fan of the whole "sad things on index cards" schtick, but that's the territory my games tend to inhabit. I prefer to quickly write something down on the fly, then throw it away when it's no longer relevant...rather than write it on a character sheet, rub it out, write something else, rub that out...etc. If this mutant animal game is going to be based on FUBAR, then it's definitely going to fall into the "sad things on index cards" genre, but I'm thinking pocketmods for the character books. Title: character's name, their animal type, a couple of permanent traits that define them, and a picture. First opening: the core stats that you need for play. Hmm...with a little bit of research, it looks like my thoughts about constraining certain aspects of the TMNT game and expanding other aspects might be a good move. I don't remember the Palladium game including any fish or pretty much any aquatic critters (except for the turtles themselves and a few amphibious critters or water loving mammals like otters...not even dolphins). The rules also present the concept that all mutants start as animals and follow a path toward humanity with their mutations...This leaves out certain elements that were distinctly a part of the Turtles TV show. 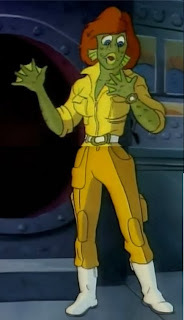 April O'Neil transformed into a fish mutant in the episode "Rebel without a Fin"
This is something that could never have happened in the original RPG. 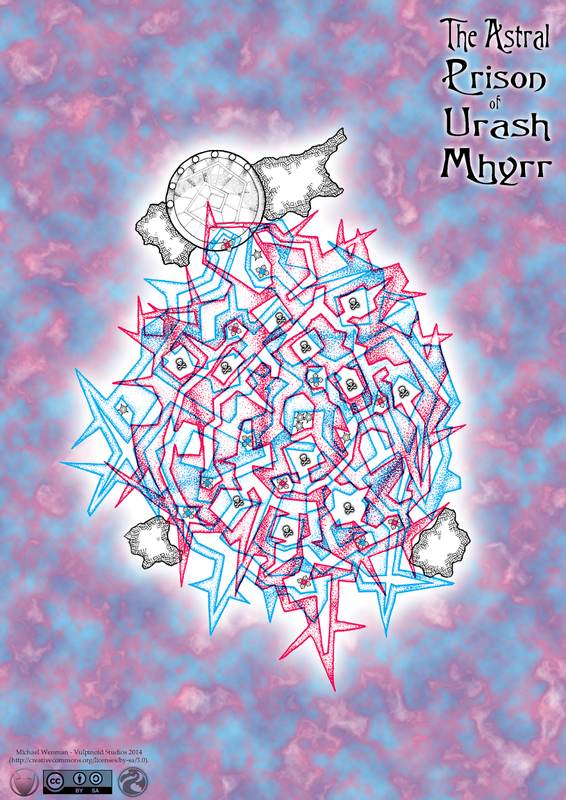 ...but the game doesn't allow for invertebrates (except for insects in the much later sourcebook "Mutants in Orbit"). I'm still tossing up names for this one, but that hasn't stopped me thinking about it. My aim for revamping this game is not to produce one of those GM-less troupe-style, minimal rules affairs...I'm just trying to streamline the play, get rid of the crunchy crap but keep the essence of dark, gritty, mutant animals hiding in a modern day dystopia (and occasionally having adventures that lead them to strange and far off places that are surreal and exotic but also filled with dangerous shadows crawling with exotic mutant animals). There seems to be a bit of talk lately about the Palladium game "TMNT and other Strangeness"; especially the concept of stripping away the "megaversal system" and injecting some story-game potential. Everyone seems to love the idea of building a character with some kind of mutagenic energy, but the characters need to be stripped of their convoluted stats and numerous fiddly skills that take ages to work out...conversely, they could do with some hooks that immediately draw them into some kind of narrative. I'm thinking of using FUBAR for the basic game structure, then applying some kind of mutagenic point system to buy special abilities and edges, then 6 simple questions. I've had a couple of people ask for a version of the Astral Prison map without the text around the outside of it. Something that serves as a better standalone sheet to place in the middle of the table when a game is underway. I'm always happy to oblige with such things. I've also been asked to provide a copy of the map without any altars, treasures or monsters on it...so here's that version. I hope you all find these useful when you decide to include them in your games. 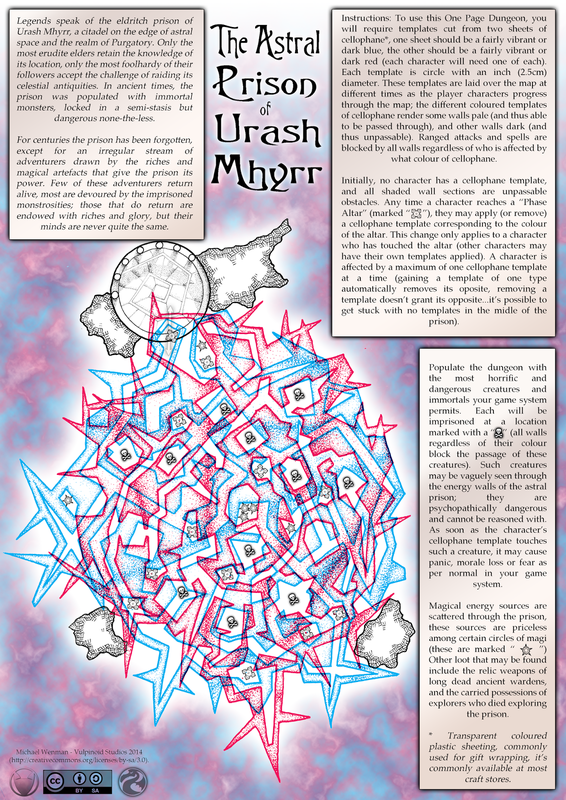 After a bit of refinement, here's my entry for this year's One Page Dungeon contest. To use it you'll need two circles of cellophane (one blue, one red, each 2.5cm/1" round), but it says that on the page anyway. There may be another update to this map in the week or so before the contest entries are formally closed for the year. ...but fueling it all, at the centre, is wealth unimaginable. 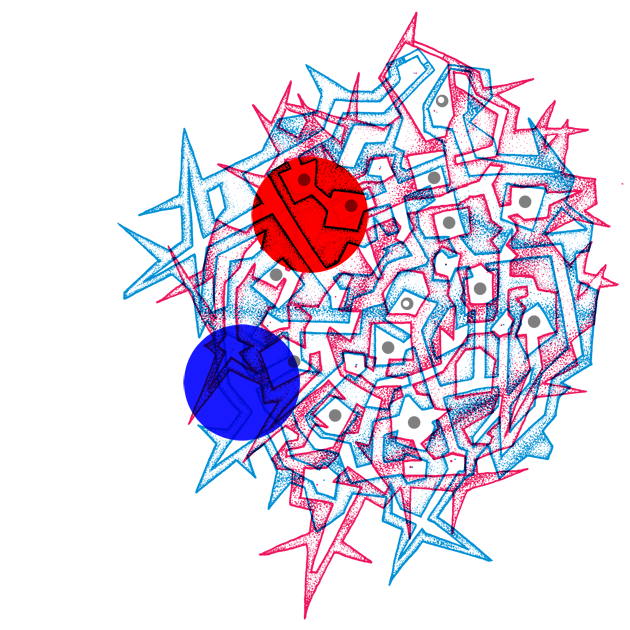 A regenerating diamond capable of fueling the prison's magic for the duration of eternity. A gem that splinters off tiny fragments of itself every millennium at a rare conjunction when the stars are aligned. Few know how to reach the prison, and those few who do know the truth are never stupid enough to undertake the journey themselves. Instead, they send adventurers to raid the prison; they rarely expect to see those adventurers alive again. This dungeon exists on two layers within the one page. Each a different colour, and each revealed by the application of coloured cellophane over the paper. Voidstone Chronicles had a good start, but things have stagnated a bit. I've updated it now twice, in the hope that it might see some more interest. Maybe it's time to start some more active promotion. Voidstone Chronicles can be found here. 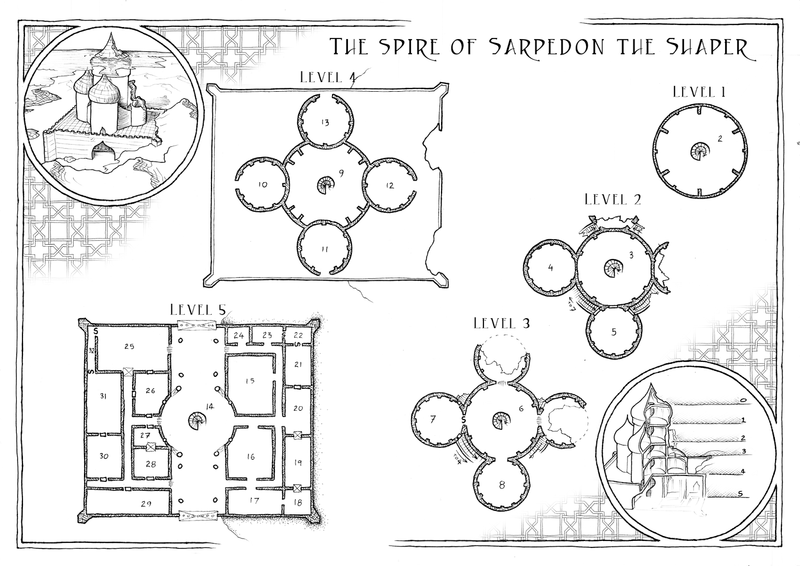 Some of you may be aware of the underwater adventure, the Submerged Spire of Sarpedon the Shaper. If not, go and have a look at it here. I've been given the opportunity to draw my interpretation of the map, and here it is. Now that this one is out of the way, I might be willing to accept other commissions.